Red shirt, with wide shadow stripes. Red v-neck, with three thin white stripes and two thin navy blue stripes in middle. Red hem on sleeves. Thin white stripe along shoulder. Embroidered emblem on left breast, with 'FIFA WORLD CUP' and then 'MEXICO'86' (without a space between) centralised in capitalised white lettering underneath. Two embroidered white concentric diamonds on right breast, with 'umbro' in white lower-case lettering underneath. White numbers on reverse, in the old Umbro font last worn by England on the previous year's tour. White shorts, with white drawstring. Thin red stripe down seams, with a thin navy blue stripe on each side. Red numbers on left thigh in the same font as on the reverse of the shirt, with two embroidered navy blue concentric diamonds on left thigh, with 'umbro' in navy blue lower-case lettering underneath. Embroidered emblem on right thigh. Red socks. Solid white diamonds across tops, edged with two navy blue hoops. As per the modified white shirt, the red change shirt also underwent subtle changes in readiness for the Mexican climate at the 1986 World Cup. The shadow stripes were thicker and the striped cuffs were removed. It was worn in the last warm-up match before the tournament, a 4-1 victory over the local side from Monterrey, Mexico, England's base for the first round of games, though the World Cup lettering was not present and there were no numbers on the shorts. The red World Cup uniform made no appearance at the tournament. England wore their white shirts in the first four matches. Then came the quarter-final against Argentina, against whom England often wore red in contrast to Argentina's pale blue and white striped shirts. This time, however, Argentina wore their alternate solid blue shirts, and England donned their white shirts again, but over the pale blue shorts and socks that were part of one of their alternate tournament strips (all pale blue). Maradona's 'Hand of God' goal put paid to England, and they got no further chance to wear either their red or pale blue shirts. 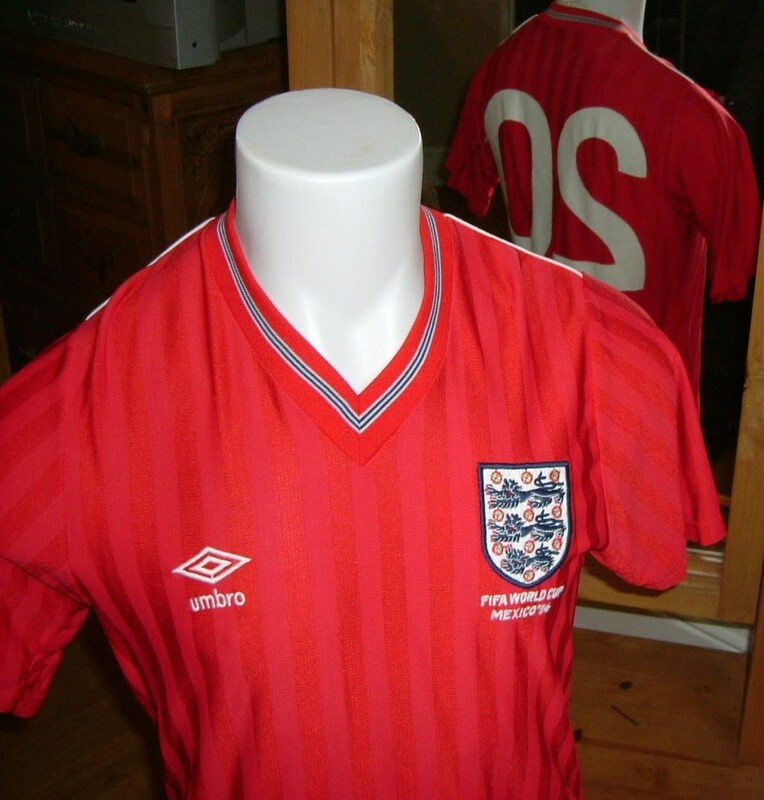 Although this kit was never worn in an official match, it did make an appearance, two years later, on June 4th 1988, when England won 7-0 at Aylesbury United in a warm-up game for the 1988 European Championship Finals. On this occasion, the World Cup lettering was present, but again, the numbered shorts were not.